Midnyte Reader: The Book Thief. 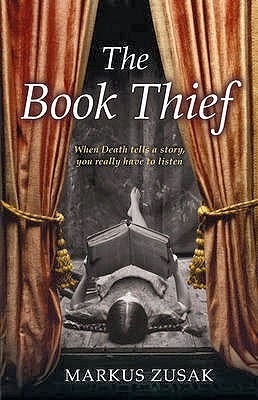 Title/Author: The Book Thief by Markus Zusak. Synopsis: It is 1939. Nazi Germany. The country is holding its breath. Death has never been busier, and will become busier still. In superbly crafted writing that burns with intensity, award-winning author Markus Zusak, author of I Am the Messenger, has given us one of the most enduring stories of our time. ~Goodreads. 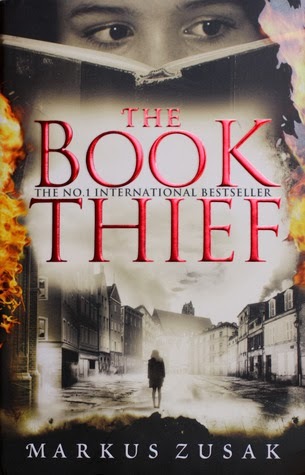 Midnyte Musings: The Book Thief was recommended to me by many people I trust. And also, practically all of America. It is a bestseller, won awards and was made into a movie. My expectations were high. Did the book live up to the hype? Well, yes and no. Yes, because the story is beautiful and poignant. It is well fleshed out, detailed and the characters are human and believable. During WWII, Liesel Meminger, the main character, is given up by her mother and is fostered to a new family. She does not always behave herself or act nicely, but I still empathized with her and found her endearing. At first, I was expecting horrid treatment of her from this newfound family, but was happily surprised that Mama, although gruff loved Liesel and Papa doted on her. The story continues with her Papa staying up late into the night with her because she can't sleep due to nightmares and subsequently teaches her her to read and write. "Without words, the Fuhrer was nothing." Hitler seduced and led a nation with his passionate words and by contrast Liesel, and those around her, find joy in words. I found this theme to be relevant throughout the book. It is simplistic, but The Nazi Party and Liesel were fueled by words. The Nazis propagated hatred and Liesel found solace. The family hides Max, a Jewish man trying to escape the Nazis. He and Liesel share a special bond and in many ways are essential to the other's survival. I also appreciated that many of the Germans in this book do not necessarily approve of the Nazi movement yet have to succumb to the laws and social norms of this time, often times doing a delicate dance for survival. I enjoyed the style of The Book Thief, not only for the fact that Death is the narrator, but the chapters titles put me in mind of a play. Then there are "asides" punctuated by asterisks that give facts, and at times drawings. Some of the lines are also puzzle pieces. This tactic was a bit more than foreshadowing as it told what would happen, but then would go on in a different direction. And, just when you kind of forgot, bam! There it was. Well it wasn't like I wasn't warned. The foreshadowing creates expectation so you want to catch up to these small hints. "Liesel observed the strangeness of her foster father's eyes. They were made of kindness, and silver. Like soft silver, melting. Liesel, upon seeing those eyes, understood that Hans Humbermann was worth a lot." ~Death. I've read stories like this, watched stories like this, and was told stories like this. So the tragedy and events weren't all that new to me and therefore, in a way, didn't bring anything new and spectacular to my table. However, I am ecstatic that a novel about the plight of WWII is a bestseller even today. I always wonder if that time in history will be forgotten, or just diminished in importance, which is exactly why Spielberg started The Steven Spielberg Film and Video Archive of the United States Holacaust Memorial Museum. The other issue I had with The Book Thief is that sometimes I felt the story dragged in places. However The Book Thief is a strong, tragic, sweet, humorous and uplifting tale. Death, the narrator. I loved this tool of storytelling. Death was matter of fact yet poetic and mournful at the same time. He made the act death something beautiful, which is an amazing feat in my eyes. Liesel Meminger - Steadfast, brave, reckless and empathetic. Hans and Rosa Hubermann (Mama and Papa) - I adored their dynamic with each other and with Liesel. Mama, brash, course and strong and Papa, beyond kind. Rudy Steiner - Liesel's best friend and partner in crime. As endearing as Liesel, but he comes with his own quirks and stories. Max - The family secret in the basement. He bonded the family in their mission to keep him safe. He also brought more words to Liesel and bonded with her regarding their beauty and importance. Starstruck Over: The strength of The Book Thief for me is the beautiful and prose and the unique style. Labels: The Book Thief, WWII. I just read this book this past month. And I absolutely loved it. Even knowing what was coming, my heart was shattered at the end, and I cried so hard I went to bed at 7 with the worst headache ever. I thought the writing was beautiful and is book is SO quotable. I don't know how people reread this book though. I don't think I could do that to myself again. Thanks for your thoughts Pam, I love that people (like me) are reading this for the first time and I loved seeing how they are responding to it. Everyone raves about this book but yet it still sits on my shelf. It's like I know I'll be a tearful mess by the end of it and don't want to risk that with raging pregnancy hormones! I love this review! 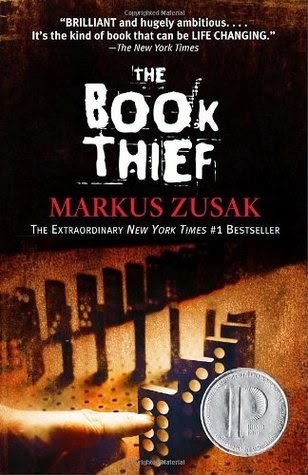 I read The Book Thief a few years back and really loved the unique style, plus while I've read a lot of books set in the same time frame, I hadn't read that many books from a regular German citizen's point of view. It's no surprise that us midnight girls loved the narration of Death! ;) Maybe by the time I come see you in late May this will be out on dvd and we can watch the movie together!